Stayble’s injectable formulation STA-363 targets patients suffering from discogenic chronic low back pain who do not respond to conservative treatment such as analgesics and physiotherapy. STA-363 not only offers patients an option when conservative treatment fails but also provides an alternative for patients who cannot afford, are not eligible or do not want to have spinal fusion surgery. STA-363 is based on an endogenous and well documented small molecule together with a contrast agent assuring safe and accurate injection. Administration will be a single intradiscal injection. Treatment with STA-363 is presumed to last the patient’s entire life and require minimal rehabilitation. 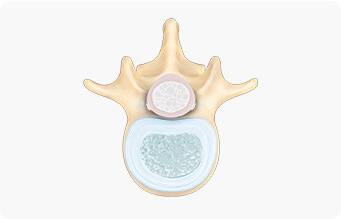 STA-363 transforms the disc into connective tissue and has therefore the potential to permanently achieve a significant reduction of the patient’s pain. STA-363 is currently evaluated in a clinical phase Ib study conducted in Sweden. 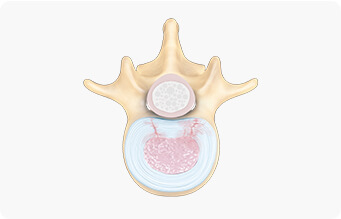 A disc consists of two main parts: Nucleus pulposus (disc centre) and anulus fibrosus (disc wall). Nucleus pulposus consists largely of a highly hydrated gel together with nucleus pulposus cells and fibroblasts . As the disc degenerates throughout ageing, tears in the anulus fibrosus appear and nucleus pulposus loses its gel-like structure resulting in a mechanically unstable disc 1. Inflammatory changes occur and the tears allow leakage of pro-inflammatory substances from the nucleus pulposus irritating and sensitising nerves both within and outside the disc2. An injection of STA-363 transforms the disc into dense connective tissue. The transformation restricts synthesis and leakage of pro-inflammatory agents and re-stabilizes the intervertebral segment. 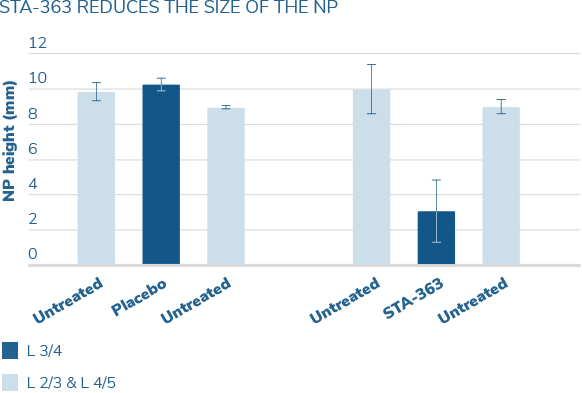 By achieving these two effects, Stayble believes that STA-363 has the potential to significantly reduce discogenic low back pain. The transformation of the disc into connective tissue induces the following changes which are anticipated to collectively act to significanty reduce the patient’s pain durably. An injection of STA-363 will stabilize the segment by transforming the nucleus pulposus into connective tissue and by rigidifying the anulus fibrosus. The rapid transformation will break the vicious cycle of degeneration and prevent further destabilization. Annular tears allowing leakage of pain-producing agents is a proposed cause of discogenic back pain2,8,9. Pro-inflammatory substances are known to produce pain when applied to the nerve roots10,11. By transforming the disc into connective tissue STA-363 reduces both production of pain-generating molecules and their spread to spinal nerves. An experience shared by many orthopedic surgeons is that patients suffering from discogenic back pain often recover with age due to fibrotisation of the disc3,4,5. This is however a slow process that may take decades. Another mechanism for spontaneous healing is the reduced prevalence of annular tears with the ageing6,7. STA-363 will, by transforming the disc into connective tissue, simulate the natural fibrotisation but considerably quicker. Stayble has performed several pre-clinical studies, both in vitro and in vivo. In vitro studies have addressed potency and efficacy. In vivo studies in a pig model have focused on disc transformation, dose dependency and local toxicity, both intra- and extradiscally. In vitro studies have been performed on nucleus pulposus cells to understand the concentration dependency of exposure to STA-363. 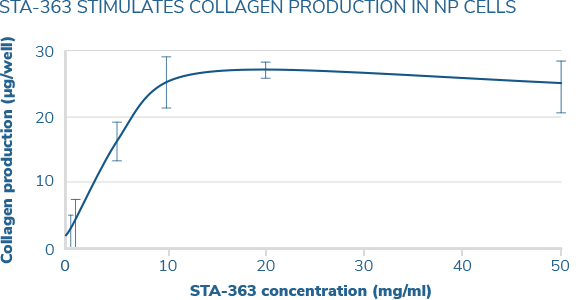 The studies demonstrate that STA-363 induces collagen production in a concentration-dependent fashion up to a ceiling level. A pig model was used to verify that sclerosis produced by STA-363 increases the stiffness of the motion segment. The L3/4 disc was injected with either STA-363 or placebo and a flexibility test was performed four weeks later. A drastic decrease in flexural movement (i.e. 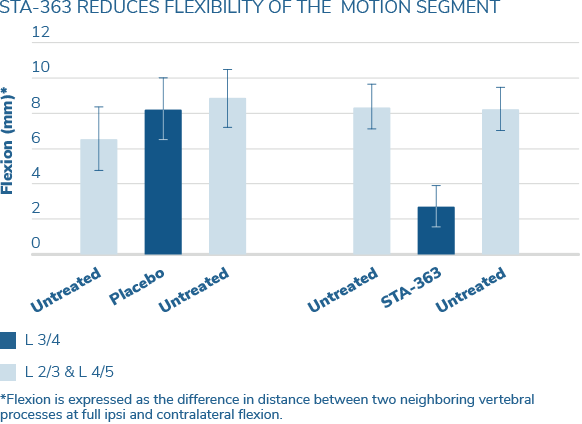 increased stiffness) of the motion segment was demonstrated comparing treated discs to both placebo and untreated discs. The discs evaluated for stiffness (see above) were also subjected to macroscopic analysis with regard to the amount of newly formed connective tissue. Fibrotisation was measured as the maximal height from the anterior to the posterior margin of the nucleus pulposus. A major decrease in nucleus pulposus replaced by connective tissue was seen in all STA-363 treated discs compared to both naïve and placebo injected discs. This study demonstrated that a single injection of STA-363 transforms most of the nucleus pulposus to fibrotic tissue. Islets of notochordal cells (asterisk in left picture) are embedded in amorphous matrix (double asterisks) in the untreated pig disc. One month after injection of lactic acid, the nucleus pulposus has been replaced by dense fibrotic tissue (right picture). Boos N, Weissbach S, Rohrbach H, Weiler C, Spratt KF, Nerlich AG. Classification of age-related changes in lumbar intervertebral discs: 2002 Volvo Award in basic science. Spine (Phila Pa 1976). 2002;27(23):2631-2644. Byröd G, Rydevik B, Nordborg C, Olmarker K. Early effects of nucleus pulposus application on spinal nerve root morphology and function. Eur Spine J. 1998;7(6):445-449. Rhyne III AL, Smith SE, Wood KE, Darden II B V, Deyo RA. Outcome of unoperated discogram-positive low back pain. Spine (Phila Pa 1976). 1995;20(18):1997-2001. DePalma MJ, Ketchum JM, Saullo T. What is the source of chronic low back pain and does age play a role? Pain Med. 2011;12:224-233. Laplante BL, Ketchum JM, Saullo TR, DePalma MJ. Multivariable analysis of the relationship between pain referral patterns and the source of chronic low back pain. Pain Physician. 2012;15(2):171-178. Sehgal N, Fortin JD. Review Article Internal Disc Disruption and Low Back Pain. 2000;3(2):143-157. Schwarzer a C, Aprill CN, Derby R, Fortin J, Kine G, Bogduk N. The prevalence and clinical features of internal disc disruption in patients with chronic low back pain. Spine (Phila Pa 1976). 1995;20(17):1878-1883. Satoru K, Konno S, Olmarker K, Shoji Y, Kikuchi S. Incision of the annulus fibrosus induces nerve root morphologic, vascular, and functional changes.pdf. Spine (Phila Pa 1976). 1996;21(22):2539-2543. Derby R, Kim BJ, Chen Y, Seo KS, Lee SH. The relation between annular disruption on computed tomography scan and pressure-controlled diskography. Arch Phys Med Rehabil. 2005;86(8):1534-1538. Murata Y, Onda A, Rydevik B, Takahashi I, Takahashi K, Olmarker K. Changes in pain behavior and histologic changes caused by application of tumor necrosis factor-alpha to the dorsal root ganglion in rats. Spine (Phila Pa 1976). 2006;31(5):530-535. Olmarker K, Blomquist J, Strömberg J, Nannmark U, Thomsen P, Rydevik B. Inflammatogenic properties of nucleus pulposus. Spine (Phila Pa 1976). 1995;20(6):665-669. We’re participating in a number of conferences and industry event every year. We are always looking for passionate people who are interested in joining us to help realizing our vision. Please leave your contact details and we will get back to you shortly.